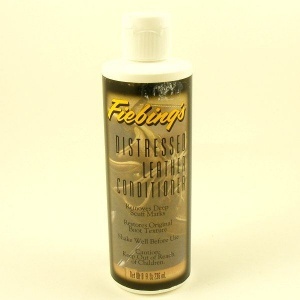 This is a rich liquid conditoner made by Fiebings, a long established American leathercare company. Shake well and apply Distressed Leather Conditioner with a soft cloth, rubbing well into the leather. Allow to stand for 10 minutes while the conditioner is absorbed. Buff with a soft brush. This is a 236ml (8fl oz) bottle.